The Lava KKT 23C is a simple yet elegantly designed mobile phone which comes with affordable price and a commendable battery back up. The Lava KKT 23C has a very good music player, VGA camera, mobile tracker and impressive memory. 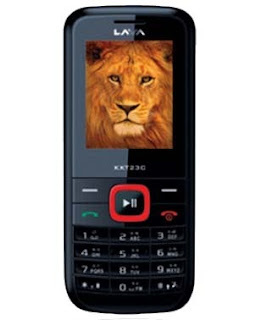 The Lava KKT 23C enthralls users with easy to use applications and an impressive user interface. The Lava KKT 23C is designed for simplicity. Using this fully loaded phone is a breeze and the high end features in the Lava KKT 23C is the highlight. Priced at Rs. 2,999, the Lava KKT 23C makes a very good buy.